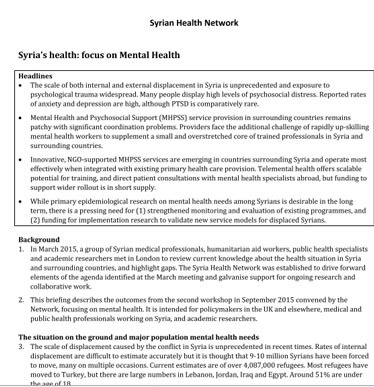 On the 21st of September 2015, MdM participated in the Syria health policy workshop that took place at the Royal Society of Medicine in London. It was organized by the –Royal Society of Medicine’s Global health and Public Health in Humanitarian Crisis Group- and the -London school of Hygiene & Tropical Medicine- . Participants discussed issues regarding the health crisis in Syria and neighbouring countries. The sessions explored topics related to the crisis: mental health and the different challenges around providing for the needs. They shed light on the challenges faced in implementing a mental health program in neighbouring countries (Lebanon, Jordan). Our mental health coordinator in Lebanon, Zeina Hassan and our International Program Manager Gareth Walker (Doctors of the world UK) shared their experience on the ground.